Three European nations that helped broker the landmark Iran nuclear deal in 2015 joined the U.S. in condemning the launch, and said it was too close for comfort to the type of intercontinental ballistic missiles used to deliver a nuclear payload. At the United Nations, U.S. Ambassador Nikki Haley said Iran was "breaking its obligation" and added, "We can't trust them." "Under this administration, the United States will not let Iran off the hook for behavior that threatens our interests and our allies," Haley said. "We will continue to impose consequences until Iran stops its provocations and complies fully with Security Council resolutions." The U.S. sanctions hit six Iranian subsidiaries of the Shahid Hemmat Industrial Group, described by the Treasury Department as "central" to Iran's ballistic missiles program. Treasury Secretary Steven Mnuchin cast the sanctions as part of an ongoing U.S. effort to aggressively oppose Iran's ballistic missile activity, including what he called a "provocative space launch" carried out by the Islamic Republic on Thursday. In another allegation against the U.S. adversary, Mnuchin said that missile attacks on U.S. partner Saudi Arabia over the weekend by Houthi rebels in Yemen had likely come with the support of Iran. The U.S. has long accused Tehran of shipping weapons to the Houthis, a Shiite group that controls part of Yemen and is being fought by a Saudi-led coalition. 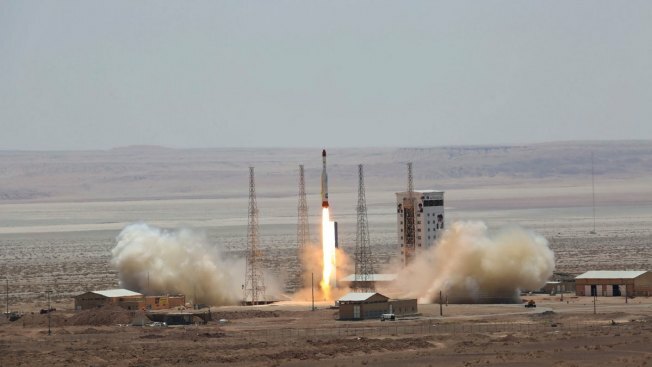 The sanctions came a day after Iran successfully launched its most advanced satellite-carrying rocket into space, in what was likely a major advancement for the country's space program. The "Simorgh" rocket is capable of carrying a satellite weighing 550 pounds (250 kilograms), Iran state television said. 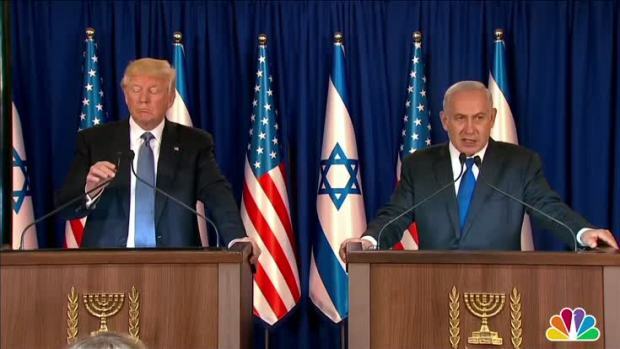 In a joint statement, the U.S., Britain, Germany and France called the launch "inconsistent" with the U.N. Security Council resolution enshrining the nuclear deal, adding that such activities destabilize the region. The grouping represented all of the Western nations that are part of the nuclear deal, which also includes Russia, China and the European Union. "We condemn this action," the countries said. "We call on Iran not to conduct any further ballistic missile launches and related activities." Yet beyond the U.S. sanctions, it was unclear what, if anything, the group could do to increase pressure quickly on Tehran. Notably, the nations stopped short of saying the launch had "violated" the U.N. resolution, saying only that it was "inconsistent" with the text. That's because the resolution calls upon, but doesn't oblige, Iran to refrain from ballistic missile development. 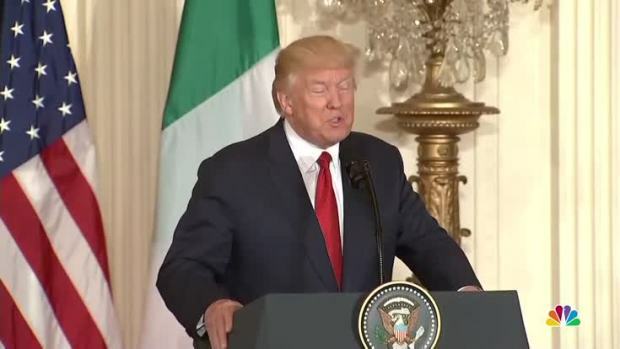 President Donald Trump criticized Iran during a joint press conference with Italian Premier Paolo Gentiloni, saying Iran "are not living up to the spirit" of its nuclear disarmament program. Yet Iran's Foreign Minister Mohammad Javad Zarif pushed back on any suggestion his country had done anything wrong by launching the satellite into space. He said Friday that Iran is complying with the nuclear deal and drew a contrast with the U.S., accusing Washington of not complying with "the letter and spirit" of the deal. "Rhetoric and actions from the U.S. show bad faith," Zarif said. He also rejected the notion that Iran was working to develop missiles that could carry a nuclear warhead. "Iran is not and will not be developing nuclear weapons; so by definition cannot develop anything designed to be capable of delivering them," Zarif wrote on Twitter. Britain, Germany and France also said they were raising their concerns directly to the Islamic Republic. Despite brokering the nuclear deal, the U.S. doesn't maintain regular diplomatic relations with Iran. The U.S. penalties reflect an attempt by President Donald Trump's administration to show it's staying tough on Iran even though Trump has yet to scrap the 2015 nuclear agreement, despite threatening to do so as a candidate and labelling it a bad deal. 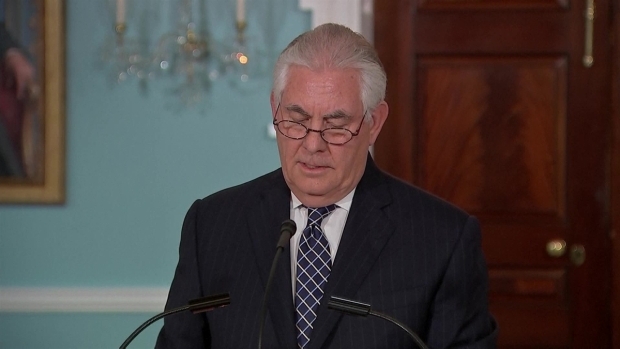 Secretary of State Rex Tillerson spoke to reporters on Wednesday, saying that the Trump Administration plans to conduct a comprehensive review of America's policy toward Iran. Under Trump, like under President Barack Obama, the U.S. has continued to sanction Iran for nonnuclear behavior such as ballistic missile activity that isn't explicitly covered under the nuclear deal. Trump's administration has also been pushing for inspections of sensitive Iranian military sites where U.S intelligence agencies believe Iran may be conducting illicit activity prohibited by the nuclear pact. The six entities being sanctioned contribute to Iran's liquid propellant ballistic missiles, the Treasury Department said, including development and manufacturing of engines, launchers, guide-and-control systems and ground support as well as the liquid propellant itself. The sanctions freeze any assets the entities may have in the U.S. and prohibit Americans from doing business with them.